WASHINGTON (CNNMoney) -- The U.S. Postal Service has agreed to hold off on closing any more post offices or mail facilities until May 15, 2012, to allow Congress time to work on a plan to save the service. The Postal Service agreed to voluntarily enact a moratorium on closures, after a series of talks with senators, lawmakers said. Sen. Richard Durbin, an Illinois Democrat, said the service agreed to the deal, and he called it a challenge to Congress to "put up or shut up." The news of the moratorium comes just a week after the Postal Service announced a plan to slow down first-class mail, which would have closed some 250 mail processing plants nationwide and eliminated 28,000 jobs. "If you don't like what the postal service has put forward (to cut costs) by closing processing facilities and post offices and eliminating jobs, then come up with a better approach," Durbin said. "It's a challenge we need to accept, and this agreement with the postal service gives us that opportunity." The Postal Service issued a statement saying that they agreed to delay all closings and consolidations, but they'll continue to review the facilities slated for possible closure during this period. "The Postal Service hopes this period will help facilitate the enactment of comprehensive postal legislation," the agency said in a statement. Durbin said that in the Senate, Majority Leader Harry Reid has said that reforming the postal service and getting it out of its debt spiral is his first priority when Congress comes back in 2012. The financially troubled agency is on the brink of insolvency and has unveiled a series of proposals to close post offices, mail processing plants and even slash Saturday mail service as ways to cut costs. The Postal Service has racked up $5.1 billion in debt this year and faces a deadline to make another $5.5 billion payment to pre-fund health care retirement benefits for future retirees due later this week, a payment required by law. Durbin said that when lawmakers finish working on a deal to fund the federal government past this Friday, that the measure would relieve the postal service of its obligation to make those payments to the health care retirement fund during the moratorium. However, Durbin could not provide more details since those negotiations are still underway. 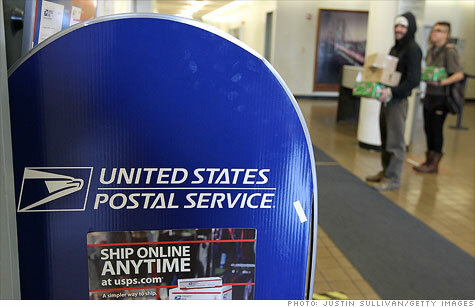 Lawmakers in the House and Senate are working on different bills to save the postal service. The Postmaster General Patrick Donahoe had blasted those bills as not going far enough, although he said that elements of both bills could work. Union groups cheered news of the moratorium, saying they hoped it would give lawmakers time to find ways to reform the Postal Service in a way that doesn't degrade service. "This is a positive step, provided the parties use the time to put together a positive plan for the future, including ways to grow the business as well as efficiencies that make sense," said Fredric Rolando, president of the National Association of Letter Carriers, in a statement about the moratorium. But Rep. Darrell Issa, a California Republican who crafted legislation to save the Postal Service, said the service has "caved to political pressure" in agreeing to the moratorium, according to a statement. He said the moratorium "hastens the crisis that is bringing the USPS to the brink of collapse."